In a small individualized student-centered style, FLC develops young adults who are college and career ready, as well as active socially conscious citizens who are successful in their professional pursuits. 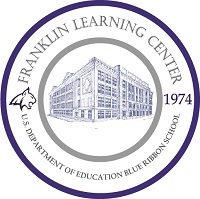 Franklin Learning Center is a magnet school committed to providing rigorous academic and professional readiness programs through interdisciplinary study and close-knit learning communities. FLC provides opportunities for students interested in professional careers in visual arts, business technology, computer science, public health, performing arts and college preparatory study. FLC students engage with the cultural heritage of Philadelphia and the world at large.